The PM is talking about renegotiating a deal reached only last year. 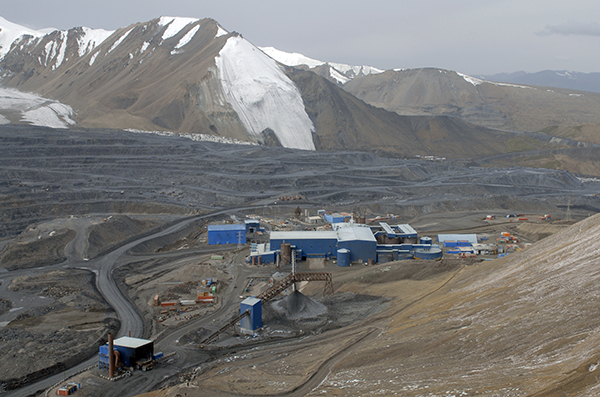 Agreements concerning Centerra Gold’s flagship mining project in Kyrgyzstan are never as final as they seem. Just one year after a Kyrgyz prime minister was celebrating the successful conclusion of negotiations with the Toronto-based company, in which the government owns a one-quarter stake, his successor is calling for revisions to that deal. Centerra chief executive Scott Perry and Prime Minister Mukhammedkaliy Abylgaziyev met in Bishkek on November 22 to hash it out, but came to few definitive conclusions. A government statement on the meeting alluded to “additional conditions” that needed to be met before last year’s deal could enter into force. Perry wore a notably worried expression in the accompanying photograph, as well he might. As the statement explains, negotiations dwelled on “increasing environmental payments and forming a social partnership fund for regional development.” All this sounds like the government is pumping Centerra for more cash. The 2017 agreement required Centerra’s annual environmental payments to the government to rise tenfold to reach $3 million. Centerra also pledged to make a one-off payment of $50 million into a state environmental fund and guarantee support for a social project. It had seemed a clear improvement on the prior deal, which was the product of a 2009 renegotiation. Moreover, it was achieved without the painful company restructuring that the government was at one point calling for. But then this April, Isakov was jettisoned from his post by parliament as a result of a political squabble involving the current and previous presidents. In June, Isakov was imprisoned on corruption charges. All this suggests the new offensive against Centerra may be as much about politics as economics. Then again, these are proving to be lean times, notwithstanding all the headline figures trumpeting growing prosperity. This year, Kyrgyzstan’s economy is expected to grow by 2.8 percent, a marked slowdown from the 4.5 percent expansion registered in 2017, according to an International Monetary Fund forecast. Indeed, there have been several months this year in which the economy actually slipped year-on-year on account of lower output at Kumtor. Kumtor’s share of the economy last year — 9.7 percent — isn’t far below the 11 percent figure for 2011. This tells an alarming story about how Kyrgyzstan, after all these years, remains pretty much as dependent as ever for survival on this fast-aging cash cow. Centerra’s management, meanwhile, may be intensifying their search for the exits. Another item on the agenda for Abylgaziyev’s discussion with Perry was the potential for outside interest in acquiring part of Centerra. China was named as a possible source of investment. For weeks now, rumors have circulated that Chinese company Shandong Gold, described on its website as “a large state-owned backbone enterprise (that) takes the lead in China's gold industry in terms of gold output,” is looking to buy the company. Perry acknowledged that international companies are sniffing around and assured the prime minister that Centerra would be quick to inform his office of any developments. It is hard to imagine Chinese investment in this economic bedrock will go down well with the general public though. Few know this better than the now-jailed former PM, Isakov. The corruption charges being laid at his door relate to a $480 million refurbishment of a power and heating plant in Bishkek. The work was done by a Chinese company and paid for with Chinese loans. And then the plant went and suffered a major malfunction last year, leaving hundreds of thousands of enraged Bishkek residents in the cold for days on end. Complaints of environmental negligence and corruption have long dogged Kumtor. Many of them may be justified. Were China to get involved, it could be a case of out of the frying pan and into the fire.